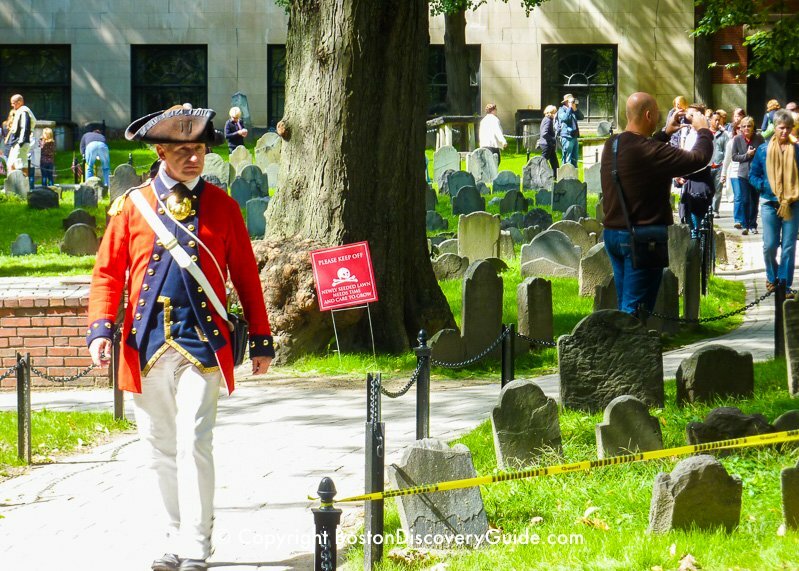 Freedom Trail tours give you a fun and informative way to experience Boston's most famous historic sites while also seeing the oldest parts of the city as well as lots of newer attractions along the way. 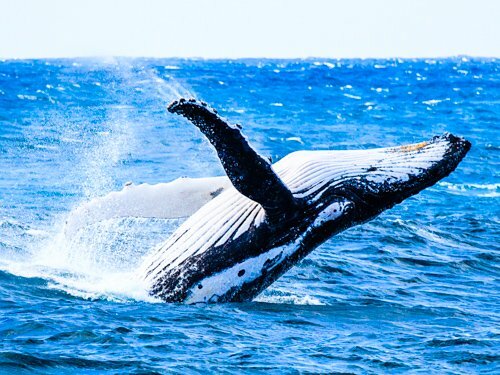 You can choose from all kinds of Freedom Trail tour options. Available tour options include groups led by professional costumed guides with deep knowledge of the city's history, free tours led by Park Rangers, "drive-by" tours on the popular hop-on hop-off trolleys and duck tours, and self-guided explorations along the 2.5 mile red brick (or painted) path that conveniently connects all the Freedom Trail sites. Take a look at all the following options, and choose the best fit for your schedule, budget, and interests. Guided Freedom Trail walking tours usually last about 1.5-2 hours. Although the Trail covers 2.5 miles, these tours include only selected sites and are much shorter. You can easily explore the rest of the trail on your own. The tour guides provide lively, entertaining narration about the historic sites and other attractions as you walk along the Trail. Some guides where Colonial costumes to add to the fun. Most tours start on monument-filled Boston Common, and end up at Faneuil Hall, part of the historic Faneuil Marketplace filled with lively restaurants and many stores and boutiques. In addition to professionally guided walking tours, you can also join free tours led by Park Rangers during July and August. For more information and schedules, go to: https://www.nps.gov/ and search for "Boston". Look for periodic discounts and deals on some of the tours - you'll see the offers when you click on the tours. 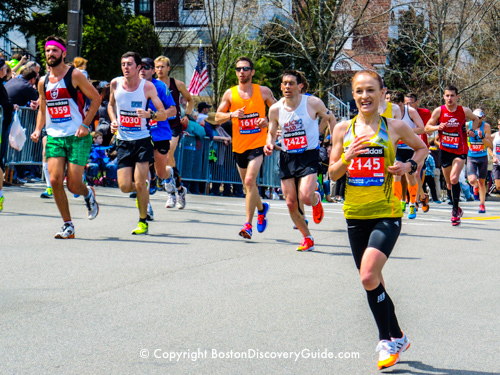 When you choose the GoBoston Discount Card, you get free admission to 40+ top Boston area attractions including a 2-day ticket to a hop-on hop-off trolley, for savings totaling up to 55%. Freedom Trail sites covered by the card include Paul Revere's House and the Old State House Museum. Also of historic interest is the immersive Boston Tea Party Ships & Museum, Plimouth Plantation, and Salem Witch Museum. Want alternatives to a walking tour? Consider the Hop-On Hop-Off Trolleys and Boston Duck Tours. 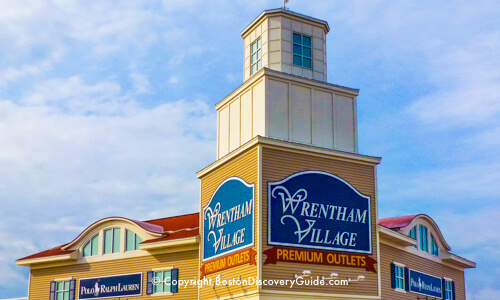 Both take you by or near numerous Freedom Trail sites, and offer additional sightseeing benefits as well. 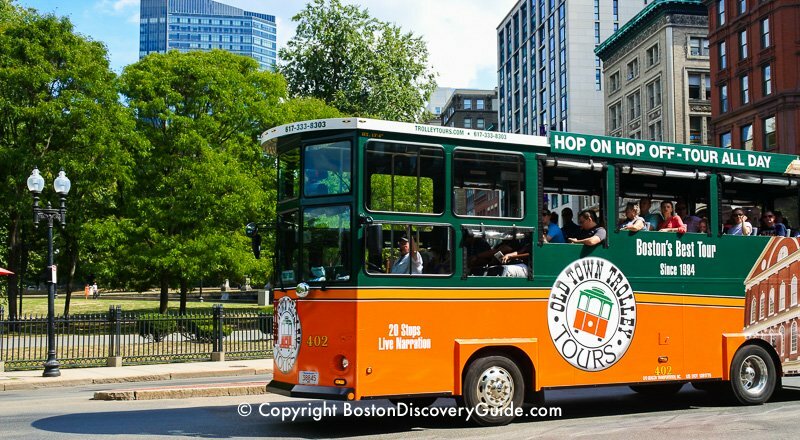 Boston's Hop-On Hop-Off trolley tours take you along a central historic route where you see several sites such as Boston Common, the State House, and Faneuil Hall. Others are close to the trolley stops. Since you can get off and then back on the trolleys as many times as you wish, you can easily go explore on foot and visit the sites at your leisure. Boston's duck tours follow a similar route to show you Freedom Trail sites as well as many other attractions. You also get a fun sightseeing tour up and down the Charles River. Availability: The hop-on hop-off trolleys operate all year. Duck Tours are available from March through late November. Boston Harbor cruises give you a unique view of the USS Constitution and Bunker Hill Monument from the perspective of being on the water. If you are on a sunset or dinner cruise, you may even be able to hear taps and the traditional sunset gun salute on the USS Constitution. 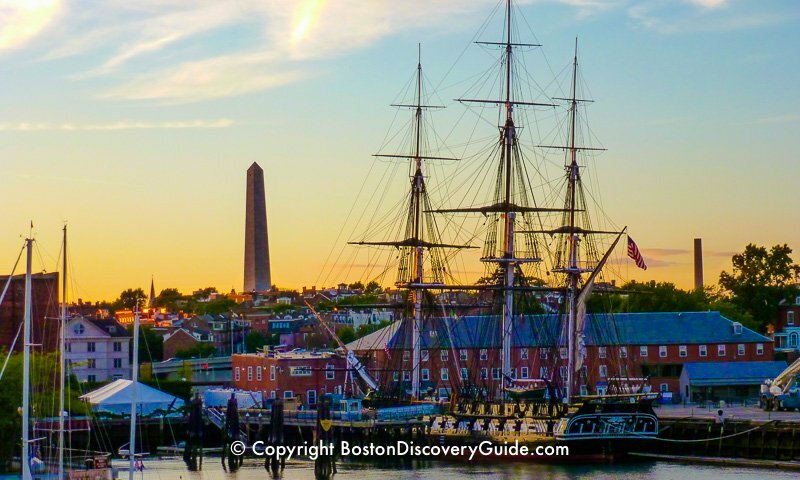 Choose the 45-minute narrated USS Constitution Harbor Cruise if you want to get off the cruise and tour "Old Ironsides," visit the adjacent USS Constitution Museum, or walk over to the Bunker Hill Monument. To get back to Downtown Boston, walk along the Freedom Trail or hop on the Inner Harbor Ferry in the Charleston Navy Yard for the 5-minute ride back to Downtown. Pick up an excellent free map of the Freedom Trail at the Visitor Information Center on Boston Common (near the Park Street T station). You'll normally need to ask for it at the counter - maps in the display racks near the entrance are not free. You can also view an online version of the free map here. Walk along at your own pace. Start and stop wherever you like. 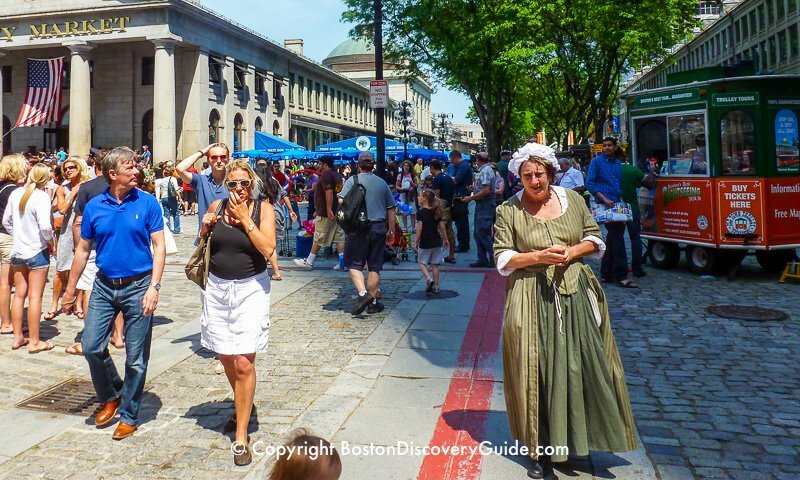 Walk fast and cover the whole trail in a couple of hours, or visit just a couple of sites, perhaps detouring to shop in Faneuil Hall Marketplace or enjoy a steaming cup of cappuccino in the North End. Boston Common in Downtown Boston anchors one end of the Freedom Trail and Bunker Hill in Charlestown is at the other. You can start at either end, or at any point in the middle. The Freedom Trail is not a loop - so if you walk from one end to the other, you will not be close to where you started. Fortunately, all of the sites are reasonably close to the T.